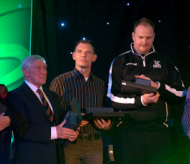 Congratulations & well done to all the winners at the Stirling Sports Awards 2012! What another fantastic night at the castle and a great achievement to everyone that was up for an award nomination. 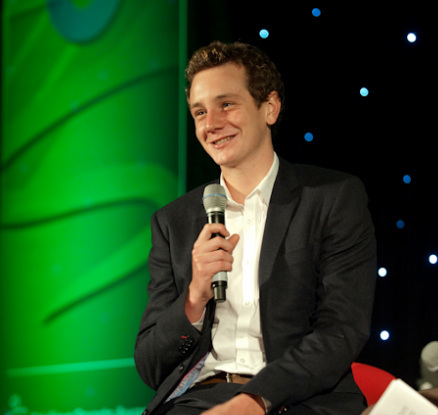 A massive thank you to Alistair Brownlee for coming along and joining us on the night as the guest speaker and for sharing with us some of his experiences as an Olympic gold athlete. Gavin won the Scottish National Youth Triathlon title in August, and in June the Scottish Schools Youth Triathlon Championships and the Scottish Open Water Youth Triathlon event. He came 3rdat the British Elite Youth Triathlon championships and was 4th in the British Elite Youth Duathlon. He won the Bishopbriggs Triathlon Youth race and was 1st Youth & 3rd overall in the Loch Lomond Triathlon in July. Gavin was one of the youngest members of the Triathlon Scotland National Performance squad and, to give you an indication of the determination of this young man, you should know that Gavin is Insulin Dependent, Type 1 Diabetic – this lifelong disease makes him almost unique in High performance Triathlon, certainly in the UK, if not in Europe at his age group! Stirling County RFC under 18’s remained undefeated for the second year in a row. They won the Ayr 10s, the Deeside 10s, the Midlands Caledonia League, the Caledonia Champions League, Dunfermline 7s, Glasgow Emirate Airline U18 7s and the Scottish Cup. A number of players represented the Caledonia District and six played at various levels for Scotland with another three on standby lists. Jack has led the Stirling Knights youth and community development programme since September 2011. He has had overall responsibility for planning, implementing and delivering a basketball curriculum for the Under 12 boys and girls and Under 14 boys and girls. Through his coaching and hard work the club had 3 players in the Scotland under 12 teams, a remarkable achievement in the first year of youth development. Jack also coached the Stirling Knights teams in the Regional development League in Edinburgh - the first time Stirling has ever had representation at this level. Jack also led the community tasters program and spent many hours visiting Primary and Secondary schools developing basketball. In June, Jack was chosen as Head Coach to the Wallace High School of Basketball supported by the Knights. Mitchell became the first profoundly deaf player to represent the Scottish National Basketball team when he played for the Scotland U18s against Norway last season. He was also selected for, and represented the Under 21 Great Britain Deaf team for the World Championships in Poland, where he won 'Best Defender' and 'Best Rebounder' of the whole tournament. He then followed this up in June by being selected for the senior men's Great Britain Deaf team for the European Championships in Turkey. bMitchell has now signed for the Stirling Knights Senior Men's team and has already had an impact in Scotland's top league. He overcomes his disability with energy and vigour and was also chosen as an Olympic Torch bearer carrying the flame through Stirling. Raymond has spent 59 years with Stirling County Cricket Club as a player, cach and active member of the Management Committee. He has also spent 15 years developing cricket in over 20 Stirling Primary Schools. He has coached the Scotland cricket captain, Bruce Russell, Willie Morton of Warwickshire and Scotland, as well as 15 Junior Internationalists. Now in his 80’s, Raymond is still involved in the development of cricket. Under Graham’s guidance, Stirling Triathlon Club now has over 300 members and is still growing, and runs the 3 biggest race events on the Scottish Triathlon Calendar. Over the years, Graham has been an enthusiastic member, racer, and committee member of the club and is now President of this ever expanding organisation. There’s no area of the club that he does not get involved in or not promote in his own enthusiastic style and Graham’s drive and enthusiasm has brought a new level to Triathlon events in Scotland. Peter has overseen the rapid expansion of Stirling Knights from one Senior Men's team to now having 150 members and 7 teams from Under 12 up to Senior Male and female sides. He is the driving force behind the club's youth development programmes, which have created more than 100 new basketball players in the Stirling area. His plans include the introduction of a new Primary Basketball League for Stirling and Clackmannanshire. A former Scottish Senior international player, Peter is the club’s Head Coach, and has given the youth of Stirling the chance to participate in basketball and play in the National Leagues. Grant is a 2nd year Mathematics student. He devotes more than 30 hours to sports training each week, alongside gaining 1st class scores in his academic degree. He has been selected to represent GB in the European Junior Championships for the past 2 years, however, a serious bike crash in the 2011 event put paid to his season. Then in 2012, another injury blow ended his chances of competing in the competition. Despite these setbacks, Grant demonstrated immense mental and physical strength to return to competition ahead of schedule and record several impressive results including a top-10 finish in a European Cup event. Jack is a 3rd year Mathematics student and a member of Stirling’s renowned golf scholarship programme that has helped produce more than 85 international golfers. With guidance from head Coach and former European Tour player Dean Robertson, Jack has taken his golf to international level in 2012. He won the British Universities Championships, was silver medallist for GB at the World University Golf Championships, a semi-finalist in the British Amateur Championship, he gained his first senior international cap, helped Scotland to win the 2012 Home Internationals and is currently Scotland’s No. 1 golfer in the World Amateur Golf rankings. Doug was 4th in the 65 – 69 age group at the European Triathlon Championships this year and 5th in the same age-group at the World triathlon Championships. He brings a broad experience to the coaching role and enjoys helping others make their own journey towards achieving their goals, whatever their level of ambition may be. He is equally happy coaching and supporting complete beginners and the club's GSB athletes. As a team Forth Valley Orienteers have had an extremely successful year, demonstrating that they are a dominant force in British Orienteering. They won the UK Clubs National Trophy final for the 6th year running…this involves scores across the various age groups and the winning team included more than 40 club members. They won the Harvester Relays, Britain’s only overnight relay, as well as the British Relays Men over 40, the British Relays Men over 60 and the British Relays Women over 40. A whole host of club members have represented national teams and the club has established a fantastic team spirit, where all abilities and ages help, support and encourage each other to perform to their best. Season 2011/12 saw the club involved in Scotland's top Senior Mens league and also (for the first time ever) the club had a National League Under 16 Mens team. On top of this, the club's youth development continued to expand with Under 12, Under 14 and Under 16 boys and girls development squads. In April, the club supported the “Jump 2 It” programme which involved over 400 primary pupils across Stirling playing in a festival in The Peak. This led to the Under 12 Academy being set up which ran for a 16 week block, taking on 20 new boys and 20 new girls into the club's development pathway. The club produced its first ever Scotland National Team players, with 3 Under 12's selected to play for Scotland in Sweden, while the Senior Men's team has 8 Scottish International players. This year the club has won 27 Gold, 21 Silver and 24 bronze medals. It boasts the current Under 16 and Under 12 boys and Under 19 Girls Open Champions and the Under 16 and Under 12 Boys overall National winners. Eight of the clubs bowlers represented Scotland at the Junior Triple Crown in Wales in August (a third of the total squad), one bowler went to Thailand for the World Youth Championships, two competed at the European Men’s Championships, and two at the European Youth Championships. On top of progressing through a host of Tenpin Bowling coaching qualifications, Anne has coached at various competitions across the world including three European Youth Championships, one world youth championships, one adult triple crown, and an AMF World Cup, on top of the countless Junior tournaments at which she has coached. Stirling Triathlon Club is the largest triathlon club in Scotland, with over 300 members; a membership which has doubled in the last eight years. The club is fully inclusive, providing training and support for mixed gender, age and ability, from social members trying triathlon for the first time, to elite world class athletes. A scheme unique to the club, and developed and implemented by club coaches, provides a structured coaching programme for juniors and seniors to work together to improve their performance, with the aim of competing at GB and international level. To date 10 juniors and 17 senior club members have competed at GB age group or Elite level. The club has 16 qualified coaches from Level 1 – Level 3 in all triathlon disciplines, and training sessions are held seven days a week. Andy won the US Open men’s singles title to become the first British male in 76 years to win a Grand Slam singles title, took Olympic gold in the men’s singles, won Olympic silver in the mixed doubles, was runner-up in the Wimbledon men’s singles and won several other ATP titles. Andy is recognised not only for his achievements but also for his hard work and dedication.